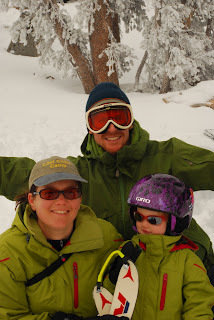 We're still on vacation, and we are in the thick of our month-long ski bum life. We have been blessed with several days of snow after a particularly dry January. Today is the first sun we've seen in about four days. It's lovely conditions out there! Several folks on the chair lift have said that the Farmer's Almanac is calling for 17 feet of snow this February! Who knows, there is snow in the forecast every day but tomorrow as far as they're predicting. I'm having to learn to ski powder. I thought I had it until this morning, the 18 inches was a little much for my weakling coast legs, and my bindings, which are showing serious signs of wear. I do hope I'll figure it out so I can take advantage of that feeling of lightness and flying without so many falls and exhausting attempts to right myself! 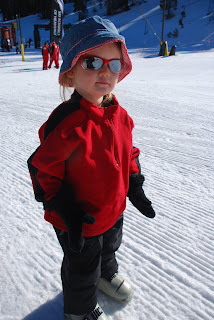 Ella is becoming a skier in her own right. We've gotten her out on the snow almost every day we've been here, and she begs for more when we're done for lunch! We got her on the lift the second day, and she can ski short distances without any assistance. She just hasn't figured out how to slow down on her own yet. We keep reminding her to "make a pizza wedge, honey! ", but I think she needs to develop a little more leg strength. Looking forward to more powder! Yeeehawww!